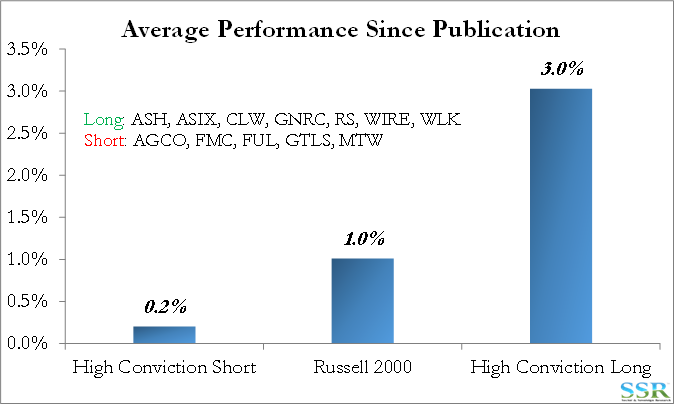 The stocks that emerged from our SMID cap analysis of the Industrials & Materials space earlier in 2017 have outperformed the Russell 2000 index on the long side and underperformed on the short – Exhibit 2. 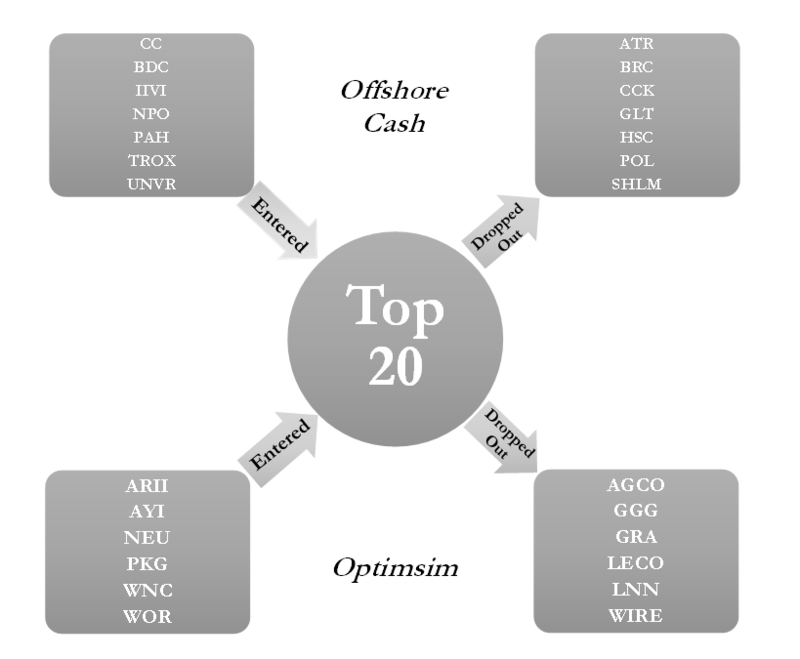 We selected these stocks by combining several ranked lists of currently relevant factors (US sales, tax rates, offshore cash, sales per employee, performance since election) with our corporate optimism framework, a qualitative assessment of end market exposures, and the return on tangible capital vs. valuation plot in Exhibit 3. While we like some of the fundamentals behind a few of the cheaper companies here, such as VSM and TSE, they do not make the cut on this analysis because they have too much of their sales base outside of the US and are vulnerable both to trade policies and a strengthening dollar. Fundamentals and strategic actions may overcome the headwinds for both, but they do not tick enough boxes to make the cut in this piece. More limited imports of competing goods from China – the electrical equipment space may be a major beneficiary here as well as some capital goods names. There is a subset of companies in Exhibit 4 for which we have sufficient history to use our standard, normal valuation models, which give us greater conviction for this analysis. Those companies are summarized by valuation and skepticism in Exhibits 5 and 6. With 2016 data, there are only marginal changes to this list and Trucking names continue to dominate at the top. Clearly any “protectionist” policies will see those with predominantly more US centric portfolios much more levered and less concerned about the possible strength of the dollar. There is somewhat less noise around tax rates using 2016 rather than LTM figures, though clearly some of the higher tax rates shown in in Exhibit 8 are still the result of special circumstances – either reflecting a translation – or lower reported income but taxes based on a GAAP income. This is certainly true for any company paying more than 40% tax in the last 12 months. Those with the higher US sales in Exhibit 7 are likely the companies with the most to gain long-term from sustained lower US tax rates. 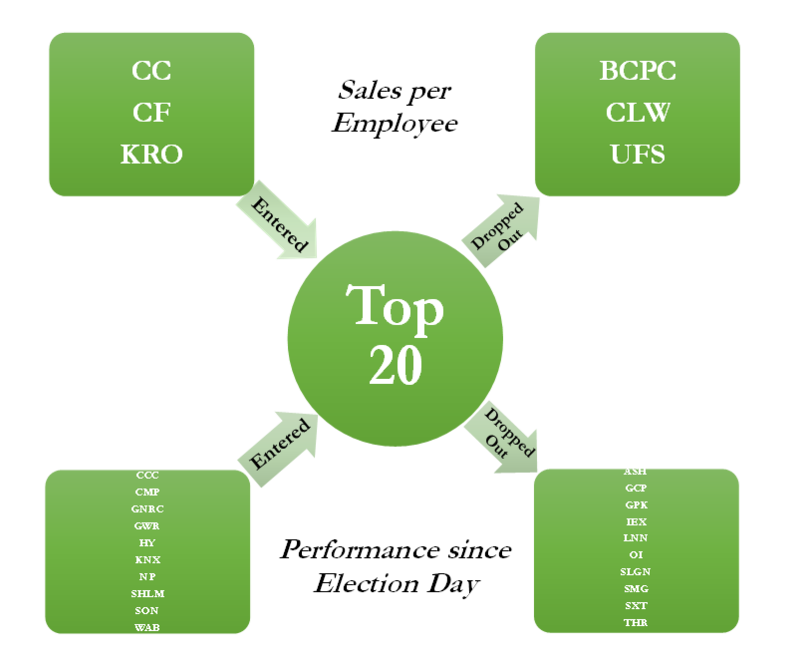 The potential repatriation of offshore cash holdings has received attention and there are a number of SMID caps with significant cash in foreign jurisdictions. In Exhibit 10 we have expressed the amount of offshore cash as a percentage of the company’s current market cap – equivalent to a special dividend or the potential reduction in share count if the repatriated funds were used to buy back stock. We assume a 15% repatriation tax. This is a contra-momentum indicator, showing what stocks have lagged post-election. It is important to note here that there are likely no companies on any lists here likely to see direct earnings gains from anything the new Administration does before at the very best Q4 2017. Consequently, there is a risk that expectations get ahead of what is practical and we see some earnings misses before we see the gains. AYI and WOR are down on recent earnings – both have a significant US sales base (top 20 in the US sales rankings in Exhibit 7) and appear well positioned from a business mix perspective (commercial lighting for AYI; steel for WOR) to benefit from domestic infrastructure stimulus. CCK has a large non-US sales profile and additional Mexico risk from recent acquisitions. 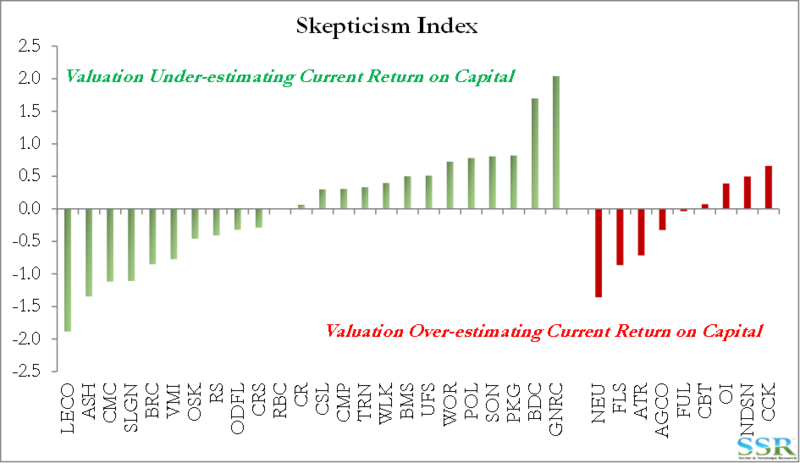 We often reference our work on corporate optimism as a complement in our process of identifying investment opportunities – simply put, those companies that habitually guide to realistic earnings expectations and subsequently over deliver not only predictably outperform, but have been shown to exhibit expanding returns on capital relative to their more overly-optimistic peers – they make better capital allocation decisions. 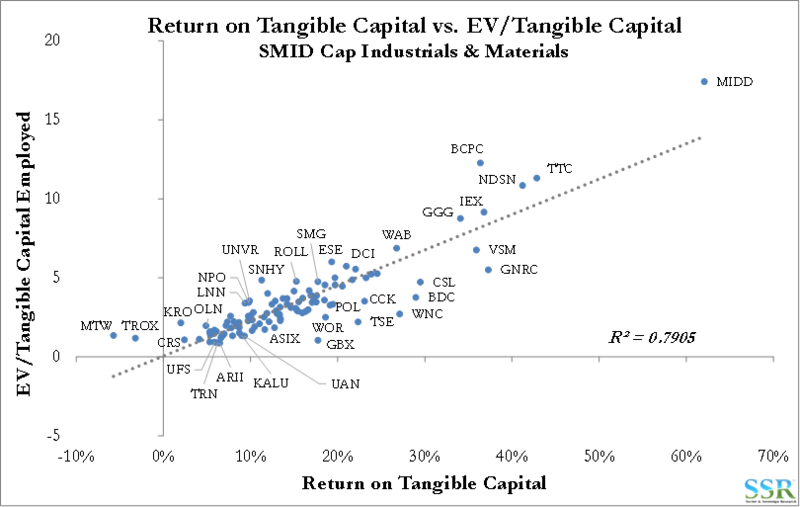 In the SMID space the results are exaggerated compared to the large cap group, where underperformers are more readily identified and held (sometimes forcefully) accountable. In Exhibit 12 we show the most conservative companies in the group – those that have consistently over-delivered and the measure is by how much annual earnings have beaten expectations. 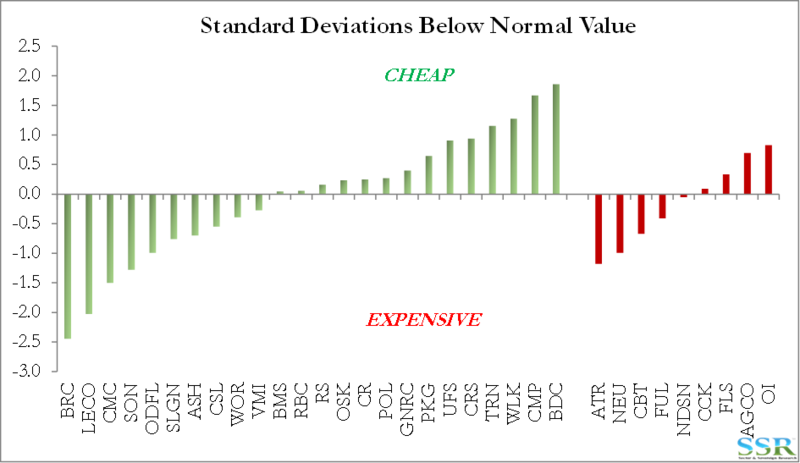 The measure is called “Optimism” but we are actually looking for the least optimistic companies and the indicator can be confusing in it labeling if you have not followed our work here – in Exhibit 12 GNRC has most consistently over-delivered and by the most significant level. 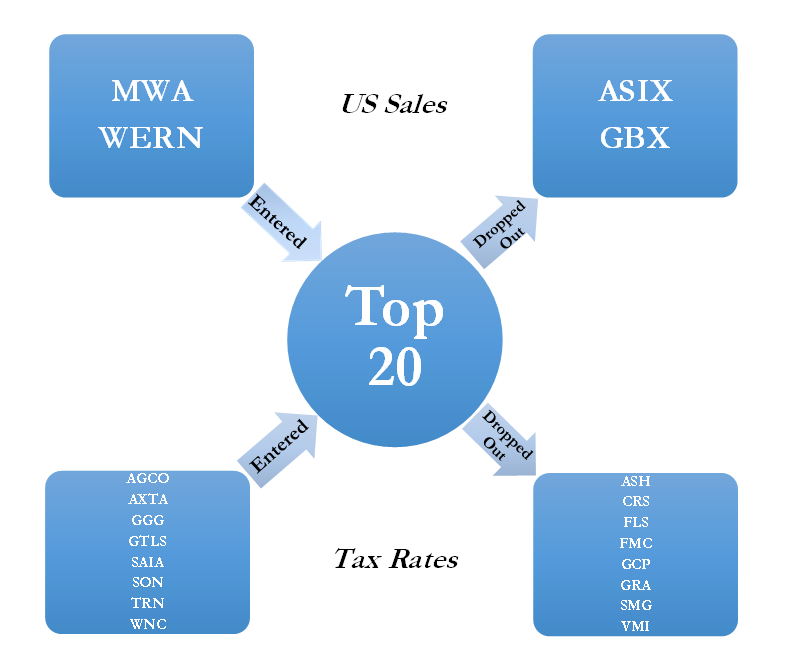 Notably, GNRC’s measure was improved by its 2016 figure – many of the others at the top of this list, including WLK and TRN, struggled in 2016 after several years of conservative self-awareness.